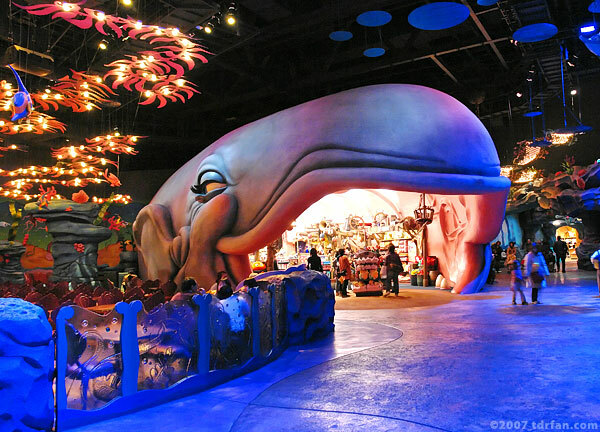 The Sleepy Whale Shoppe is a prime example of the attention to detail found in Tokyo DisneySea. Although it sells standare-fare souvenirs, the theming and attention to detail are something to marvel at, both inside and out. If you've been on the Storybook Land Canal Boats at Disneyland in California, The Sleepy Whale Shoppe will no doubt invoke memories of riding a boat through the gaping mouth of Monstro the Whale. The Sleepy Whale looks significantly less menacing than Monstro (the Sleepy Whale has no teeth for example), and is a very cool place to visit even if you're not interested in purchasing anything.